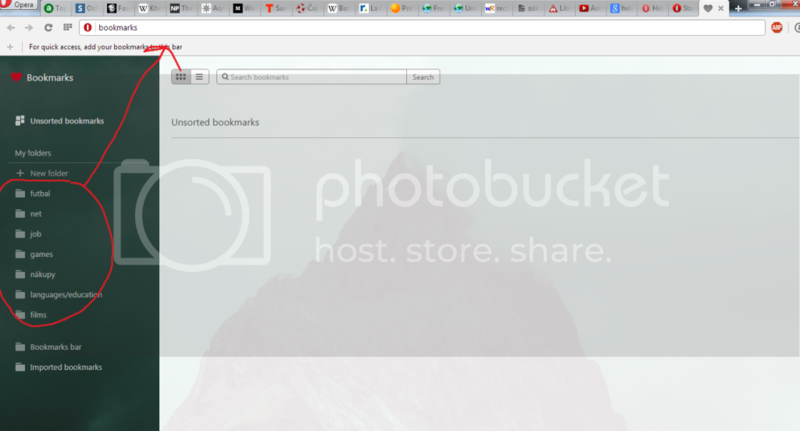 Hello, i just wanted to ask, how to get my folders from the bookmarks page up into the bookmarks bar..
because you can only create a new folder on the bookmarks bar, but somehow cannot draft them up into the bar..
Click on the opera button , top left hand corner to open the menu then click on Bookmarks, the first one in the menu and not the one with the heart by it. You get a menu that pops out where you can drag and drop, right click for various options, and whatever. I tried to do it through that screen like you did and it can't be done. It would be nice to have full management on that screen, maybe a future update. Sorry, just realized you still can't move folders around even with that menu. My mistake. Hold your mouse over the folder you want to move and check on the round circle with the check mark in it and the folder should turn blue. Then you can drag it to the bookmarks bar down the left side menu but not directly up to the bar at the top - hope this makes since - just figured it out myself by fooling around with it a little. You can copy and paste, but using Ctrl+C and Ctrl+V only, there is no right click option. Use this within the bookmarks manager and you can put bookmarks and folders into the bookmarks bar.